High performance Layer 2-7 unified platform delivering comprehensive Ethernet testing solutions for IP forwarding devices in each stage of R&D, experiment , quality control, performance monitoring and production line test. With support of high performance 10G and 10/100/1000M load modules TestStorm can deliver an ideal cost effective L 2-7 protocol testing and emulation solutions. Full IPv4 and IPv6 protocol stack support, per port simulate tens of millions of interfaces and realistic connections. 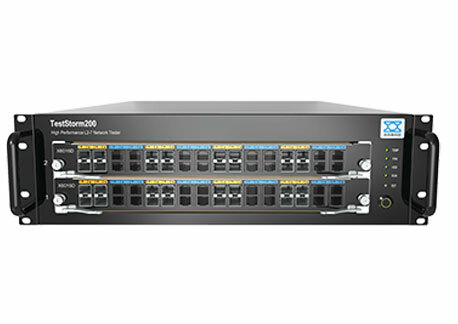 High performance and full-specification Ethernet test modules running on TestStorm series platform, providing a full-function Ethernet test solution.Armed with 36-core and more powerful processor, X series load modules deliver a unprecedented performance for complete Layer 2-7 network testing.Classified by the port rate: - X6000 series support 10/100/1000 Mbps per port - X8000 series support 10 Gbps per port.